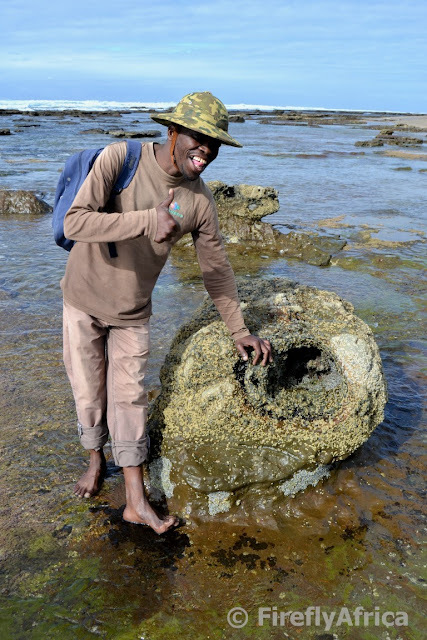 ECTOUR CEO and travel blogger Jonker Fourie got to tick off a major item on his South African travel bucket list when he joined Benny Mbotho on a guide tour of the petriefied forest and fossils at Mzamba on the most northern part of the Wild Coast. 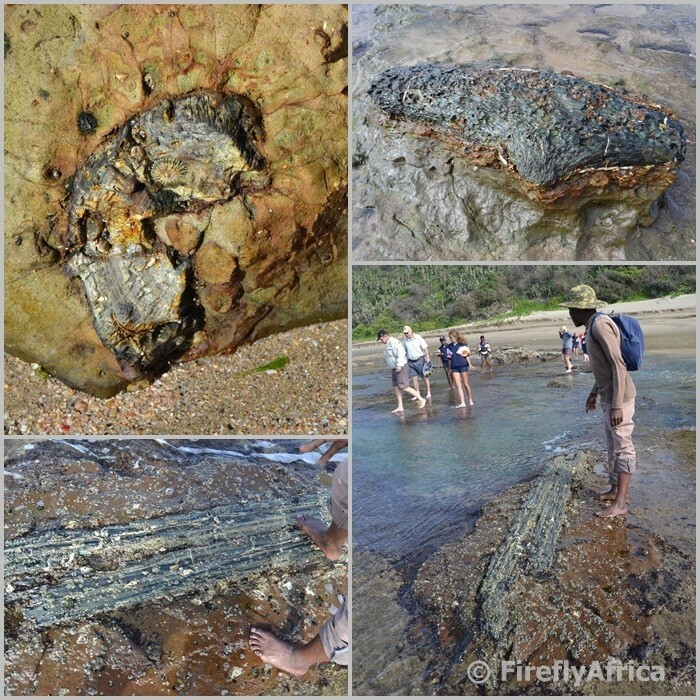 The Mzamba Fossils and Petrified Forest on the northern Wild Coast has been on my "To Do" list for a long time now. I just never had chance to visit that part of the Wild Coast yet. 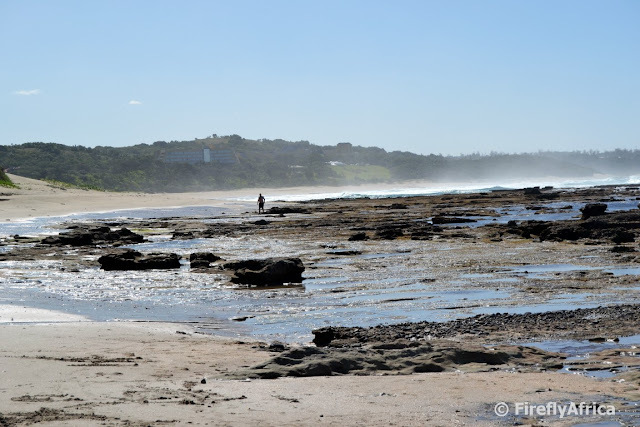 That was until a road trip to Durban had me spending a night at the Wild Coast Sun on the border between the Eastern Cape and KwaZulu Natal. The first thing I did after checking in was to enquire about going to see the fossils and I was informed that the tour goes out at 9am every morning. Nine o'clock the next morning I was there (breakfast and an early morning meeting done already) and met Benny Mbotho who does the tours. I was joined by a couple of other visitors as well as a school group. After having a look at the exhibit in the hotel, he took us down to the beach and we headed south. After about a kilometer we got to the headland area where the petrified forest is located. Luck was on my side today as it was low tide which meant that we could go out on the reef to see the fossilized wood in the rocks. Although called a petrified forest, the trees that formed it didn't actually grow here. 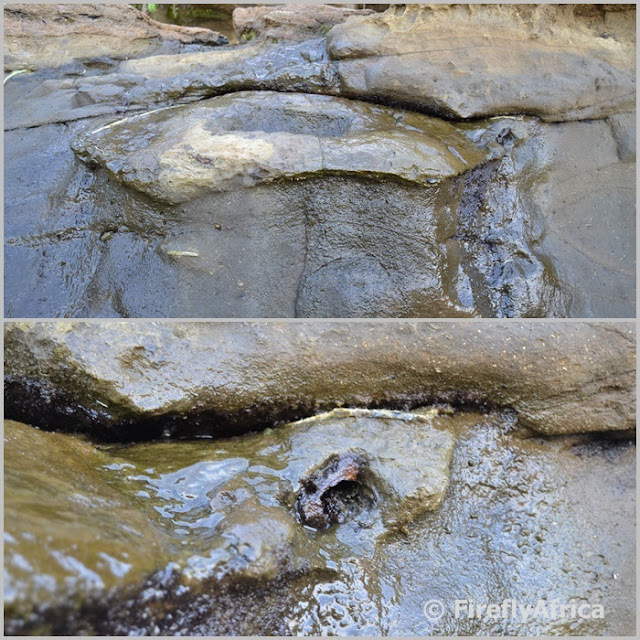 They were washed down rivers and deposited here millions of years ago. The wood then got waterlogged and was submerged where marine worms penetrated them. The wood became silicified (converted into silica) and formed what you see there today. At first I wasn't sure what I was looking for but after Benny pointed out a few I realized that they were all over. Literally. In closer inspection you can actually see the growth rings and other lines. Again I thanked my lucky stars for the fact that the tide was low as most of these would be covered at high tide and we would have missed out big time. A short distance further we started seeing the fossils that also form part of the Mzamba Cretaceous Deposits. Here you really kicked a fossil out from under every second rock, behind it, in front of it and between it. 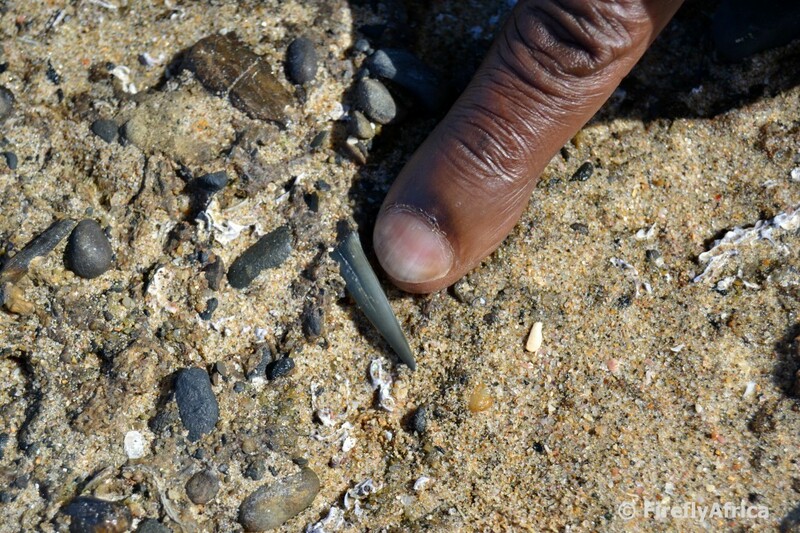 Fossils are also found in an exposed 10-metre cliff band along the beach. The deposits consist of greyish-brown sandstone and limestone that is extremely rich in fossil material dating back 80-million years. 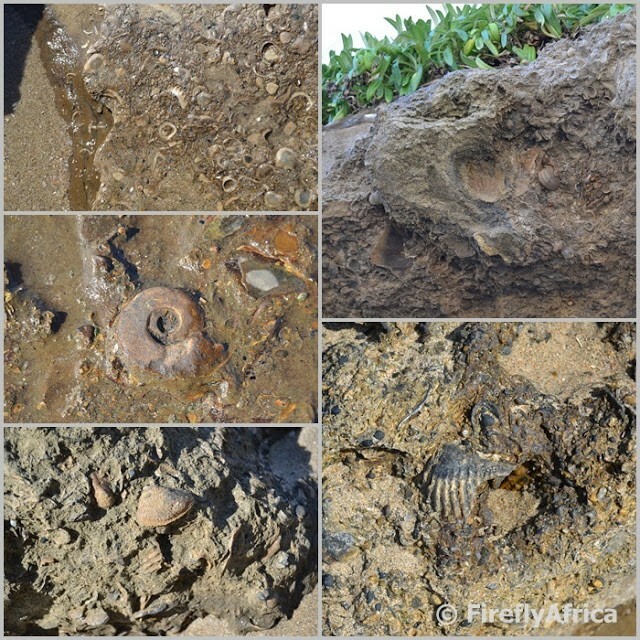 The deposits include masses of marine shells which include beautiful examples of tightly coiled ammonites, echinoids (sea urchins) and bivalve shells. Benny even pointed out a fossilized shark tooth in one of the rocks. In actual fact, Benny isn't just a point out guide. He is an absolute wealth of information and knowledge, has a permanent smile and will show you as much as possible. The giant clam shells in the rocks were huge. 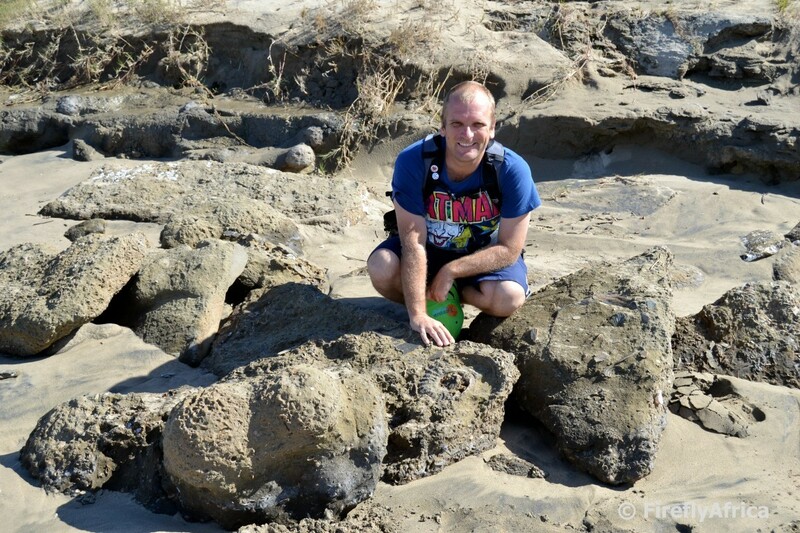 One of the fossils pointed out to us even looked like it could be a fossilized sea turtle. The shell is prominent while there is a head and eye socket to the right hand side. 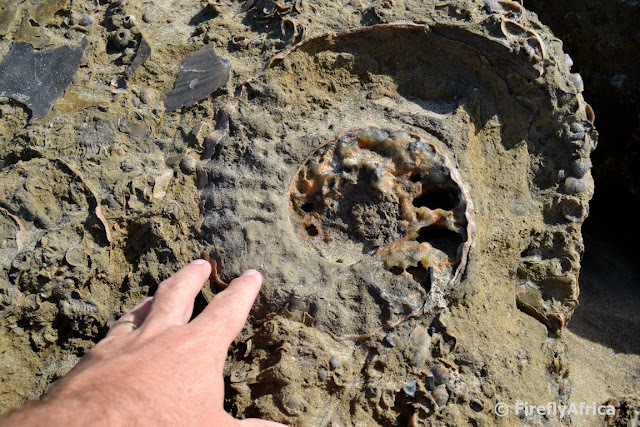 I have a couple of small ammonites in my own collection, but a few of those that we saw where huge. I can only wish to be able to add a specimen like this to my collection. I am able to add this photo to this collection of fossil photos though. At the furthest end there are a series of cliffs and overhangs known as White Man's Cave. 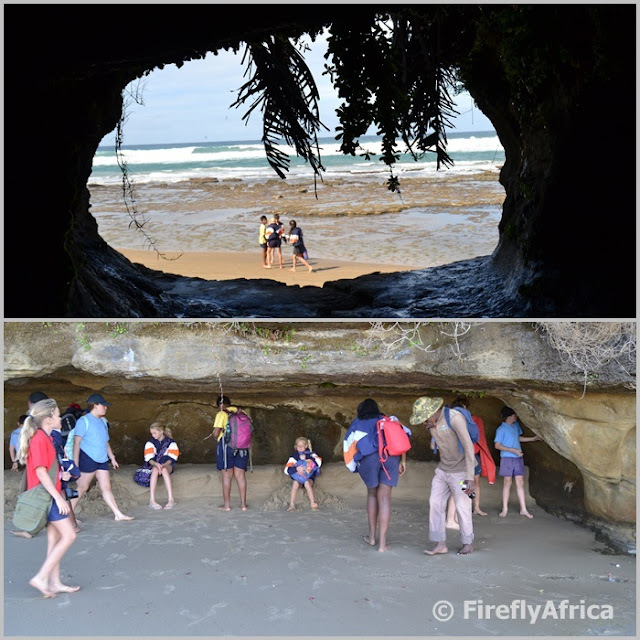 The interesting part of these is that you can sit inside them and look up at fossils in the cave roof. 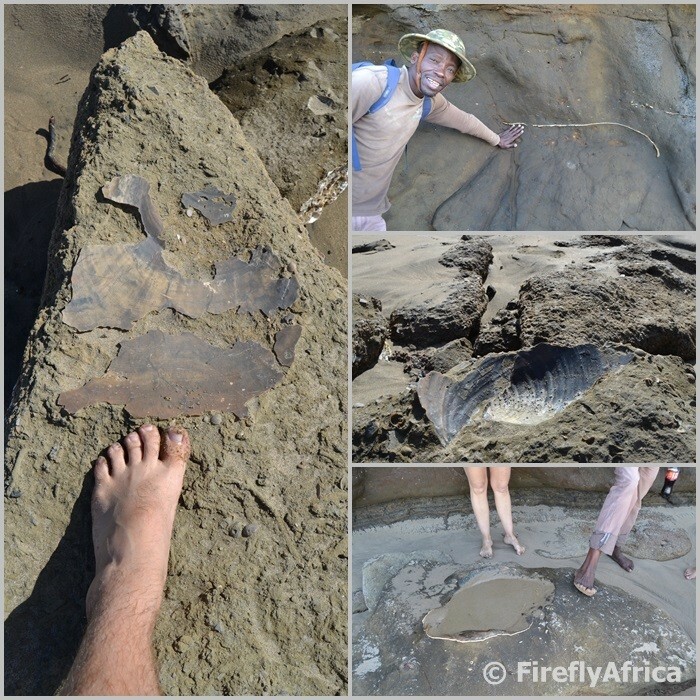 Benny even pointed out a fossilized Strelitzia and compared it with a modern day Strelitzia. You won't believe it if you don't see it and posting this I realize that for some reason I excluded the pictures of that. You will have to maar go and look for yourself.